There's nothing like freshly baked rolls at the dinner table, but when there are only three people to feed, there is no point in making a large batch of rolls. 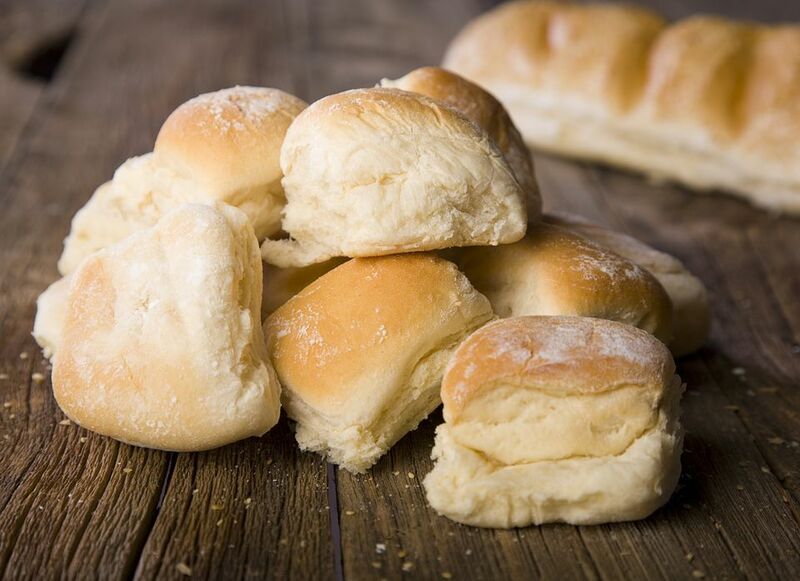 This small batch of white bread rolls is perfect for small families and the rolls can even be used to make sandwiches. In a medium bowl, mix water and yeast. Add milk, butter, sugar, salt. Stir. Add 1 1/2 cups of flour and mix well. Slowly add in enough of the remaining flour to make a dough that follows the spoon around the bowl. Turn dough out onto a lightly floured surface and knead for 4 minutes, adding more flour as needed until the dough is soft and smooth to the touch. Place dough in a medium greased bowl. Turn dough over in the bowl so that the top is also lightly greased. Cover with clean cloth and let rise in warm, draft-free place for 1 hour or until doubled in size. Punch down dough. Turn dough out onto a lightly floured board and knead for 4 minutes or until the bubbles are out of the bread. Shape dough into a loaf. Divide dough into 6 small rolls, 5 medium rolls, or 4 large rolls. Place on greased baking sheet, 2 inches apart. Cover and let rise in warm, draft-free place for 45 minutes or until doubled in size. Bake bread at 375 degrees F for 10 to 15 minutes or until the rolls are golden brown. Remove rolls from sheet and let cool on the rack. Breads made with milk have a soft crust while breads made with water will have a harder crust. To soften a crust that is too hard, store the bread in a plastic bag. If you are using powdered milk instead of fresh milk, measure the dry milk into the bowl and add the correct liquid amount separately. For one cup of milk, use three tablespoons of dry milk and one cup of water. Both dry and fresh herbs can be added to most yeast breads. Three tablespoons of fresh herb equals about one tablespoon of dried herb.